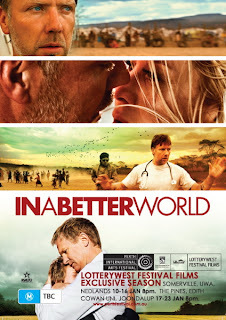 IN A BETTER WORLD is a pretentious, po-faced drama about the impotence of liberals in the face of brutality. It works by inter-weaving four examples of bullying that affect an earnest Medecins Sans Frontieres doctor called Anton (Mikael Persbrandt). In a medical camp in Kenya, Anton is forced to treat the savage gangster who has been brutalising the women of the village. He shows the liberals' reluctance to judge, treating the Bad Man as his Hippocratic oath demands, despite the objections of the villagers. Back in Denmark, Anton is bullied by a mechanic. Once again, Anton refuses to defend himself - literally turning the other cheek, in order to show his children that intelligence has triumphed over ignorance by refusing to stoop to its level. His words sound unconvincing. By contrast, young Christian (William Jøhnk Juels Nielsen), recently bereaved, returned to Denmark, and friends with Anton's son, Elias, puts up a more muscular response to bullying. On his first day at school, he makes a moral judgement and intervenes to help the bullied Elias. And faced with the impotence of Elias' father - an impotence Anton claims is the high moral ground - Christian once again takes matters into his own hands. What can we say about this film? It is well acted (particularly by the two children), beautifully photographed (DP Morten Søborg using a Red One), and moves at a swift pace. But the characters are archetypes rather than real people - they exist to make a point rather than to involve us in their distress. As a result, the emotional scenes between Christian and his father (Ulrich Thomsen) do not have the emotional power that they should. Moreover, writer-director Susanne Bier fails to create tension, so clumsily does she foreshadow her climactic scenes. I also wonder whether Bier intended to so thoroughly discredit the possibility of Liberalism in her film. And I wonder whether the Academy realised that is what this movie did when it voted it the Best Foreign Language Film of 2010. It is, of course, no such thing. IN A BETTER WORLD won the Best Foreign Language Film Oscar in 2011, beating Biutiful, Dogtooth, Incendies and Hors de la Loi. It also won the Golden Globe for Best Foreign Film. IN A BETTER WORLD played Toronto 2010 and Sundance 2011. It was released in 2010 in Denmark, Sweden, Norway, Finland and Italy. It was released earlier this year in Hungary, Brazil, Estonia, France, Germany, Greece, Israel, Spain, the USA, the Netherlands, Portugal, Belgium, Canada, Australia, Turkey, Russia, Singapore, Poland and Argentina. It is currently on release in Japan, Ireland and the UK.